It should be obvious by now that Cohlton Schultz (130 kg, Sunkist) loves a good challenge. Schultz, the Cadet World champ in 2017 and Junior World bronze this past September, is currently in the midst of his senior year at Ponderosa High School in Parker, Colorado. And, very shortly, the age-group star will officially be launching his career as a Senior Greco-Roman athlete. 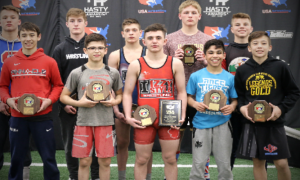 Shortly after Schultz attempts to capture his fourth state title next month, he will set out on a trip across the Atlantic Ocean to compete in a tough international tournament. 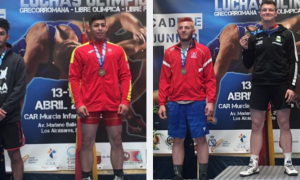 These post-scholastic season jaunts are nothing new for the 18-year-old — he wrestled in the Junior-level Austrian Open in both 2017 and ’18, taking gold last year. But instead of shuffling off to Austria yet again, he’s heading roughly 615 miles northwest to Nykobing Falster, Denmark, the sight of the 2019 Thor Masters Invitational. 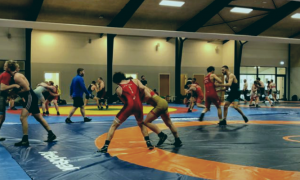 Unlike the Austrian Open, a tournament in which US Juniors routinely do very well, Thor Masters is competed at the Senior division, international wrestling’s equivalent to the Major Leagues. Or you could simply say “Olympic level” and call it even. Outside of what have now become Schultz’s annual early-spring European excursions, he has also spent time overseas on plenty of other occasions throughout the previous summers. Croatia, Serbia, France — and of course, Greece and Slovakia, the two nations where Schultz won World medals — all take up space on his growing passport. But it’s a little different this time around. The competition will offer a higher scope of difficulty than even the well-traveled Schultz is used to. Does he betray any trepidation at all regarding this climb up the ladder? That’s precisely why he’s going. The “damage” Schultz speaks of, many have witnessed what it looks like. His style as a Greco-Roman competitor is akin to a puma waiting in the brush; movement is deliberate and measured until it’s time to strike. Once that time arrives, prey have no chance. At least that’s what it has been like for Schultz through most of his domestic age-group career and a sizable portion of his international adventures. 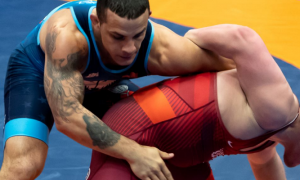 Dating back to 2016, Schultz has lost a mere seven individual Greco matches — two in 2016 (with one coming in the Cadet World Championships); two in 2017; and three in ’18, though one of those came against Anthony Cassioppi in the Junior World Team Trials best-of-three series that Schultz eventually won. As for the other two bouts, they took place at…World Championship events. Or, you could just sum it up like this: five of Schultz’s seven losses since ’16 occurred against experienced international wrestlers on foreign soil. Because of that fact, and because he has taken advantage of numerous opportunities overseas while achieving one success after another, Schultz’s degree of self-assurance keeps rising. He is, to say, aware. Take for example one particular training camp in Sweden last year. Schultz was mixing it up with a bevy of Senior athletes, including Olympic and World bronze medalist Johan Euren. They had a sort of exhibition match. 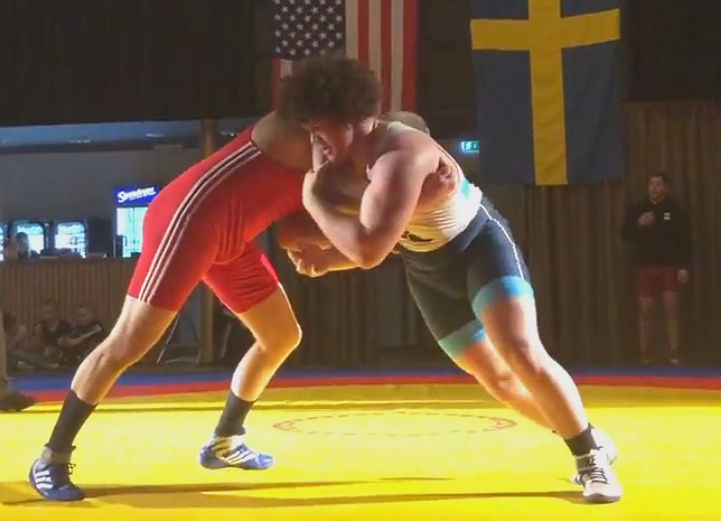 In the video (which is not available publicly), the high schooler can be seen pressing Euren, gaining position on occasion, and even picked up a reversal in the beginning stages of the bout that provided a reminder of Schultz’s deceptive nimbleness. Euren took the match 5-1, but it was a fight the entire time, and that was the Coloradan’s main takeaway. Screengrab of Schultz’s match against World/Olympic bronze medalist Johan Euren in Sweden last year. At 18, Schultz has naturally progressed to a point that suggests he would indeed be ready for heightened competition, anyway. 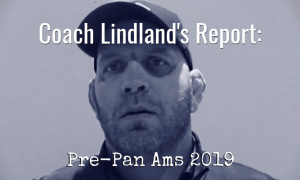 He owns a Cadet World title, just added a Junior bronze, and will enter the summer as a major candidate to take a step or two higher on the podium at the Junior Worlds this coming August in Estonia. But it’s not his skill or resume why Schultz is prepared to go toe-to-toe with verifiable adults on the main stage. It’s his attitude. All throughout last summer, and even before that, speculation swirled around Schultz’s potential landing spot for college (he has since committed to Arizona State). Social media, wrestling outlets local and national, and message boards filled up with rumors and hypotheticals. It was a lot of noise. And it carried on during Schultz’s high school season before hanging in the air above his international forays in the proceeding months. The chatter was practically inescapable, and made all the more complex given his stature in one style along with his undeniable potential in another. 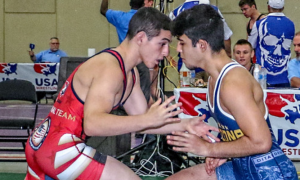 Colleges wanted him; the National Greco program feels like it needs him. But even during the kind of chaos that typically balloons and swallows the egos of most athletes, Schultz’s mercury hardly moved. He not only took it all in stride, he completely embraced accountability. “Ultimately, I put myself in this situation and I’m not backing down. I want to be an NCAA champion and then I want to be a World and Olympic champion, too. I am willing to make it happen and I am willing to put in the work for it,” he said at the time. 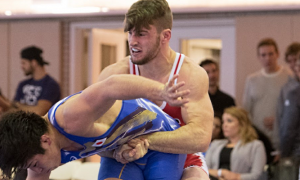 So how does Schultz feel now that the college situation is settled, knowing he is embarking on the next phase of his wrestling life without having to mind the looming presence of a decision so many on the outside were irrationally concerned about? Again, it’s his attitude that sets him apart. The next few weeks are not less important than whatever the goings-on at Thor Masters will have to offer. Schultz has that fourth state crown he’s chasing, as well as some other history. Should he prove successful, he will also become the first Colorado high school wrestler to win four state titles above 200 pounds. These things matter, though the dominoes are going to fall quickly. This is a young man who doesn’t hold a lot of tolerance for downtime. There won’t be some prolonged breathe-out period following the Colorado state tournament, just like there wasn’t last year, or the year before that. Schultz’s calendar stays packed and he wouldn’t have it any other way. Big picture, Schultz’s presence at that camp is going to be pretty good for everybody.